​Most property owners opt to have a tree's stump removed after it has been cut down. Having ugly stumps in your yard and landscape is generally unattractive. Stumps invite pests, such as ants, beetles, wasps, pets and other vermin. Further, they will begin to decay looking even more unappealing. Instead of having to live with decaying and dying tree stumps, call Pensacola Tree Service to have been removed by grinding. Whether we removed your tree or not, we are happy to come out to your property to provide a free estimate to remove one or more tree stumps. We can usually get out to your home or business within 24 hours and have the job completed within 1-3 days of your call. Most stumps are removed by grinding. On the rare occasion where you need to have a stump complete removed - roots and all - we can bring a backhoe to your property to completely dig it up. However, this will cause a damage to the surrounding area as well as required backfill, depending on the size of the stump and roots. Typically, property owners opt to have tree stumps ground down below the ground so all appearances of it are eliminated. Further, you can then re-plant the area with grass seed, sod, or landscaping materials. Lastly, the grinding process produces wood chips that can either be hauled away or re-cycle in your landscape as mulch or compost. 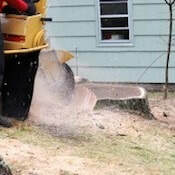 We provide discounted pricing on stump grinding when purchased in conjunction with our tree removal service. However, even if you didn't use us to remove the tree, we will provide you with a fair, affordable price. During our estimate process, we will come to your property to assess the stump(s) you desire to be removed as well as discuss what to do with the wood chips. Further, we will ascertain how best the get the stump grinder to the stump, avoiding any damage to your lawn and landscape. We will provide you with a verbal quote as well as a written one emailed from our office the same or next day. All of our work is insured and our employees covered by worker's compensation so you are protected from any financial and legal liability. Is the tree service licensed and do they employ the practices laid out by ISA and TCIA? Do they use well-maintained stump grinding machines to effectively and quickly grind the stumps? Do they provide you with both an immediate verbal estimate as well as a written quote? Can you schedule them quickly for the project after getting the quote? Do they provide discounts when purchasing tree removal and tree stump grinding? Do they take the precautions to minimize or eliminate damage to your property when grinding; and, do they tody up as they go leaving your landscape in a clean condition? Do they offer past client references as well as have good internet testimonials? Do they employ a team of tree service experts with years of experience? Do they offer a 100% client guarantee? If you do not answer to positively to all these points, then we recommend you continue looking for a more qualified tree service. 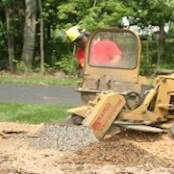 Stump grinding, while not difficult, is a project only for professionals with the proper experience and equipment. We exceed all the above conditions, so call Pensacola Tree Service the next time you require stumps removed from your property.